Luca Paolini and Stijn Vandenbergh slip away from a lead group of 10 riders after the Paddestraat section of cobbles. The pair took 10 seconds, 15 seconds and quickly the gap couldn’t be bridged by an attack, only a concerted chase would work. This was the moment the race was won. The cold was evident with riders wrapped in unconventional thermal layers and even fans watching video streams complained their feeds were frozen. If the temperature stayed near freezing all day the race didn’t take long to warm up as they covered over 46 kilometres in the first hour. After a few tries The Early Breakaway formed after 40km with Will Clarke (Argos-Shimano), Florian Vachon (Bretagne-Seche Environnement), Cyril Lemoine (Sojasun), Jérôme Cousin (Team Europcar), Zak Dempster (NetApp-Endura), Gatis Smukulis (Katusha), Preben Van Hecke (Topsport Vlaanderen) and Cofidis pair Julien Fouchard and Nico Sijmens. Behind the race was fast but steady. The group got five minutes but a crash in the bunch saw Gert Dockx dock with the rode and break his collarbone whilst Sky’s Geraint Thomas took a hit too. Over the Kruisberg and the tempo was fast to drop some thanks to the climb and a nagging crosswind but at the front nobody was going clear. The same on the Taaienberg where for once there was no move by Tom Boonen. Instead a few riders pulled away going over the top but it was not wild. It was on the Eikenberg where things changed with Sylvain Chavanel (OPQS) leading over the top ahead of Gerald Ciolek (MTN Qhubeka) and the Frenchman was joined by Marco Bandiera of IAM Cycling. The pair bridged across to the remnants of the early breakaway and there was only so long that Chavanel could ride in a group and he sprang solo. Behind a group had formed that included Vandenbergh, Thomas, Greg Van Avermaet (BMC) and Martin Wynants (Blanco) and at one point Vandenbergh was chasing … whilst team mate Sylvain Chavanel was up the road. Don’t rush to conclude rivalry because there are no race radios in this races outside the World Tour calendar but regardless the move didn’t help. But still, with the cold it was impossible to imagine Sylvain Chavanel staying away, the calories needed were huge and cold air is denser which only makes the task harder but there was a headwind too. Chavanel sat up on the Molenberg whilst behing Van Avermaet led a frisky chase and we had a group of 10 leaders with over a minute on the peloton. Such was the lead that behind the likes of Sep Vanmarcke were left to make test efforts on the Molenberg but with a 90 second deficit he couldn’t do anything. FDJ missed the move completely and Yoann Offredo made some visible but fruitless attacks. It was from this group of 10 that Vandenbergh and Paolini crept away after the Paddestraat section of cobbles. Cofidis’s Egoitz Garcia led the group over these cobbles, his bright yellow Mavic helmet making him easy to identify. Garcia is one of those rare Spaniards who loves the cobbles, the kin Flecha or Freire. But as they finished the section and reached the Lippenhovestraat, Vandenbergh and Paolini went clear and there was no direct effort to chase with Garcia continuing to pull rather than getting reinforcements. This left the pair to ride to the finish, no easy task but at least the mission was clear. Behind nobody wanted to chase for obvious reasons. Neither of the two leaders was a proven winner, the kind you just can’t afford to let go. So nobody chased and if the pursuit rolled smoothly they lost time with the gap almost reaching a minute. Up ahead the two were working well despite forming a visibly incongruous tandem. Vandenbergh is one of the tallest in the peloton at 1m99 whilst Luca Paolini is 1m74 and rides one of those bikes where the top tube and down tube merge to form the headtube. Vandenbergh’s frame is so large it could double as a farmyard gate and his seatpost is like a broom handle. But if Paolini was getting shelter he began to rock and was turning a large gear as they rushed into Gent, as if he was reaching that state of fatigue when mistakes are made. But if there were any mistakes they came from Vandenbergh who put in an attack with 2km to go which seemed more like a long lead out for his old Katusha team mate. And then again Vandenbergh led Paolini all the way to the 300m to go sign when the Italian pounced and sprinted clear for the win to win by several lengths. But there was little Vandenbergh could do, he’s not a sprinter and has not won a race since 2007. Behind Sven Vandousselaere (Topsport Vlaanderen – Baloise) won the sprint from the group of eight riders, a surprise. He had one year with Omega Pharma-Lotto in 2011 and has had many results except a third place in the Belgian national championships last June. Overall this wasn’t the greatest race to watch. Whilst the riders braved extreme conditions, viewers might feel the experience left them a bit cold. The big names sheltered in the bunch and if the winners went clear with a long way to go the experience lacked suspense. But that’s racing and the riders who made showed themselves in the last 50km were rewarded, there were no accidental winners. Note 145 riders finished, an impressive number given the tempting warmth of the team car. Thinking wider we didn’t learn too much about rider form or team tactics. 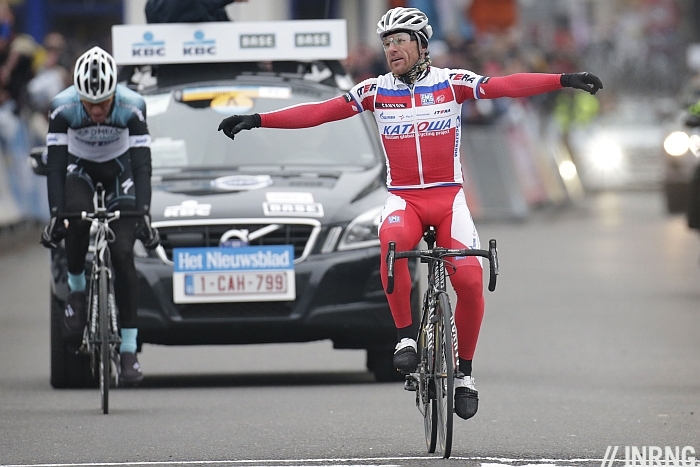 Katusha won the day with Paolini and placed Smukulis in the early break. OPQS had numerical superiority with Vandenbergh and Chavanel but the Frenchmen had done too much work in the headwind to count. Blanco, Sky and BMC each placed a rider in the lead group of 10 but couldn’t get much more. I left out “Gerva” Paolini from my race preview because if he’s often in the top-10 in the classics, it’s often by stealth. I picked him for the podium last year but he’s more the kind of rider who takes, say, eighth place in the Tour of Flanders. But he finally won and is the second oldest winner of the race after Johan Museeuw. It’s his biggest win by a long way and helps put some shine back on his name after the spectre of doping cast a shadow across his name. Tomorrow’s Kuurne-Brussel-Kuurne is being menaced by the cold weather and snow. A decision will be taken at 11.30am local time to see if the race goes ahead. Although I am a fan of Katiusha I had a feeling that Vandenbergh made the most part of work, so he deserved the first place. Well maybe I am wrong, what do you think? “Doing the work” has nothing to do with deserving to win. Letting someone else do the work so you can win is a pretty good strategy. 1m99? My God, that’s about 6’7″! Well done Paolini, but there’s plenty of shelter behind a 6’7″ rider! Training ride this morning was definitely the coldest I have experienced in more than a year! Filled my bidons with hot water, but were cold after 30 minutes! As you mentioned, impressive that more than 140 finished in such weather! would have made it to the finish with a podium place, instead he would have been swallowed up by the group later on! I thought it was great to see Paolini win. He seems like one of those guys who’s deserving of a big win but has always sacrificed himself in the service of others. In what may be his last year as a pro I’m glad he finally got a big win. I’m looking forward to seeing how he fairs at Flanders after his impressive performance last year. Not often will you see riders so wrapped up in a race. Good to see Thomas back in the road groove, my tip for a big win if not this Spring but next. Great to have dry roads but my god its cold here. Good depiction, and a good race, but certainly not a vintage one. The best, as usual: panache-to-no-avail specialists, Chavanel and Van Avermaet, as well as newcomer Egoitz. Cheap-smart Paolini winning like Italians classically win the classics, cheaply and smartly. Classic. “Cycling’s suffered from doping because fans did not know what they were watching was real” Did you see Katusha’s manager’s response about doping? Come on guys, put 2 and 2 together. what made this race boring was the chase group was down 40ish seconds with 10km to go and they couldnt work together to reel them back? i understand chavanel since it was his teammate but everyone else disappointed me. jurgen roelandts is losing any sort of contender status with me. Depending on where you stand, does this show the (dis) Advantages of no-team-radio? Or were the chasers’ tactical brains had been rocked to death with years of using team-radio? Though funny things like favourites did not realise the eventual winner had broke away did happen in the old time as well. Funny you say that Vandenbergh’s frame could double as a farm gate. I was watching yesterday and thought it looked like a toy underneath him, compared to Paolini’s. It may be big but I suspect relative to their proportions it would be smaller. It was not a great race but the winner made things happens, he got everything right. Just a slight inconstancy, at the beginning you talk of a puncture but in the main text you refer to a gear change leading to the quick release lever and thus to Campag. this will of course be in the wrong thread! A lesson for Omega-Pharma – never let a non-sprinter go up the road with a sprinter in tow! Rock’s, Good point especially when you have quality and quantity. If I didn’t know any better I would think, perhaps, Mr. Vandenbergh might be depositing around 20K more euros than the second place prize money usually gets. An awfully suspicious “attack”, if you ask me. But that kind of stuff never happens anymore, right?